Today I am going to show you how to set up a repeating alarm in android. In the previous post I showed you how to set up a simple alarm. An in this post I will show you how to set Up a Repeating Alarm. For this you need an extra class just to notify that the repeating alarm is called. Let’a look at the java code. // We want the alarm to go off 5 seconds from now. // the one that was scheduled. 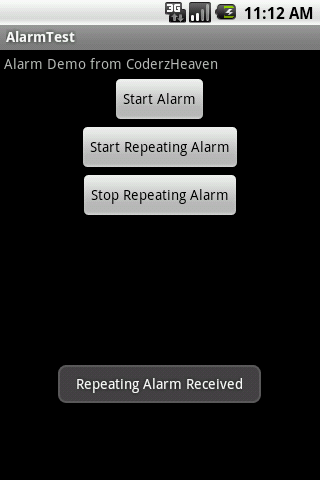 Here we have three buttons one to set up a simple Alarm that is a one shot alarm and other button is for starting a repeating alarm and the third button for stopping the repeating alarm. Now let’s see how the layout looks like. Now create a new class named “RepeatingAlarm.java” and copy this code into it. This class receives the repeating alarm intent. Now run it and see the result. i created applicatoin using android 1.6 ..